In Two Keys at the Same Time from Sovereign Grace Ministries on Vimeo. While God commends the development of skill (Prov. 22:29), and laziness is no excuse for lack of preparation, there are times that even deliberate practice doesn’t keep us from messing up. But God’s strength is perfected in our weakness. When things don’t go as planned, people are able to see more clearly our humanity, and hopefully our humility. Of course, some times we can cover up mistakes without anyone noticing or being distracted. If you can do that, great. But there are other times (like playing in two keys) when the best choice is simply to stop what you’re doing and start over. Amazingly enough, God can continue working, even through our mistakes. I spent a significant portion of the past few years overseas, and so I’m not always up to speed on American pop culture. As such, I sometimes feel like the man from 2002. 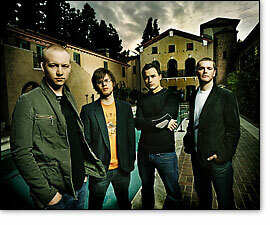 I first heard the band The Fray when I returned to America a year ago, and they were already well-established. I must admit, I wasn’t a big fan when I first heard them – I’m not really into Emo or anything close – though they have grown on me. The band members’ lives were largely formed in Denver churches where they helped lead worship, and in the Christian school three of them attended. Slade, 24, and guitarist Joe King, 25, were several years ahead of drummer Ben Wysocki, 21, at Faith Christian Academy. Wysocki and guitarist David Welsh, 21, played in the same worship band. The band avoided Christian record labels, saying God called them to the secular market instead. “I feel he would be disappointed with us if we limited ourselves,” Wysocki says. “If I handed somebody a double grande mocha latte and told them, ‘Jesus loves you and has a wonderful plan for your life,’ they might throw it back on me. The recent changes include learning to deal with the temptations that often accompany fame—including female fans who are looking for more than just an autograph. “There’s also this subconscious pressure,” says Welsh, the only unmarried member of the group—and he’s getting married in a few weeks. “You don’t want to disappoint yourself and the three guys you’re spending most of your life with.” He adds that their years of friendship make it easier for them to speak frankly with one another. Still, they admit that one of their biggest struggles is staying grounded in their relationship with Jesus. “We’re all just learning that there are a lot of more proactive things that need to be done,” says Welsh, adding that with time on the road, they’re rarely able to attend their home churches. “So,” he says, “a lot of that now falls into our hands. Do you listen to The Fray? Do you agree with their take on doing one’s job well, and letting the Gospel come in after that? I get what they’re saying, but I’m afraid it borders on a kind of mentality that pushes evangelizing to the back burner, when in fact, it is our Great Commission. The Fray’s most famous songs are Over My Head, and How To Save A Life.